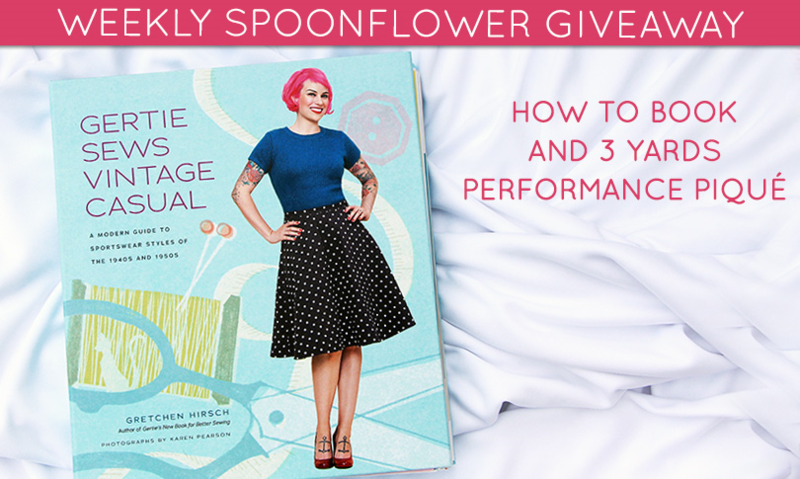 Win a Sewing Book + Performance Piqué! This week we're excited to offer one lucky winner the chance to take home a copy of Gertie Sews Vintage Casual— a new book from sewist extraordinaire Gretchen “Gertie” Hirsch! In this follow-up to Gertie’s New Book for Better Sewing, Gretchen “Gertie” Hirsch celebrates the classic casual styles that icons like Katharine Hepburn, Audrey Hepburn, and Rosie the Riveter made famous—think wide-legged trousers, fitted capri pants, beach rompers, shorts, knit tops, jeans, and day dresses. In Part I, Hirsch introduces key techniques for sportswear construction—from working with knit fabrics to the intricacies of pant-making—and in Part II, she showcases a 30-plus-piece vintage-inspired casual wardrobe. We're throwing in three yards of Performance Piqué for you to get started stitching up your closet full of new garments! Enter by Tuesday, September 16th, 2014 for a chance to win. The winner will be announced on the blog on Wednesday, September 17th. Congratulations Sarah Saleet– winner of our Eco Canvas giveaway! Spoonflower Holiday Giveaway ends with a round of limited edition t-shirts. But you can also buy your own! August 18th Is Free Swatch Day!